The crop water need (ET crop) is defined as the depth (or amount) of water needed to meet the water loss through evapotranspiration. In other words, it is the amount of water needed by the various crops to grow optimally. The crop water need always refers to a crop grown under optimal conditions, i.e. a uniform crop, actively growing, completely shading the ground, free of diseases, and favourable soil conditions (including fertility and water). 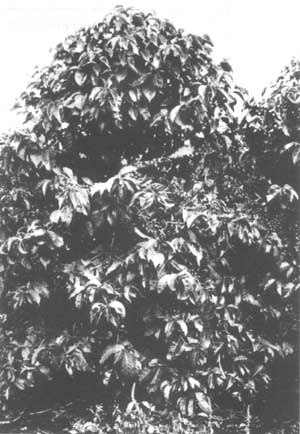 The crop thus reaches its full production potential under the given environment. · the growth stage of the crop; fully grown crops need more water than crops that have just been planted. Section 3.1 indicates the influence of the climate on crop water needs: this influence is given by the reference crop evapotranspiration (ETo). Section 3.2 indicates the influence of the crop type and growth stage on crop water needs: the influence of the crop is expressed in the crop factor (Kc). Table 3 indicates the effect of the various climatic factors on crop water needs. The highest crop water needs are thus found in areas which are hot, dry, windy and sunny. The lowest values are found when it is cool, humid and cloudy with little or no wind. The influence of the climate on crop water needs is given by the reference crop evapotranspiration (ETo). The ETo is usually expressed in millimetres per unit of time, e.g. mm/day, mm/month, or mm/season. Grass has been taken as the reference crop. ETo is the rate of evapotranspiration from a large area, covered by green grass, 8 to 15 cm tall, which grows actively, completely shades the ground and which is not short of water (see Fig. 5). Evaporation pans provide a measurement of the combined effect of temperature, humidity, windspeed and sunshine on the reference crop evapotranspiration ETo (see Fig. 7). Many different types of evaporation pans are being used. The best known pans are the Class A evaporation pan (circular pan) (Fig. 8a) and the Sunken Colorado pan (square pan) (Pig. 8b). · the E pan is multiplied by a pan coefficient, K pan, to obtain the ETo. If the water depth in the pan drops too much (due to lack of rain), water is added (see Fig. 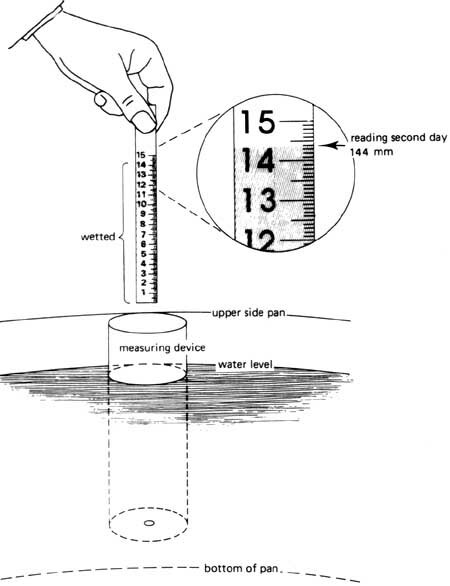 9a) and the water depth is measured before and after the water is added. If the water level rises too much (due to rain) water is taken out of the pan (see Fig. 9b) and the water depths before and after are measured. When using the evaporation pan to estimate the ETo, in fact, a comparison is made between the evaporation from the water surface in the pan and the evapotranspiration of the standard grass. Of course the water in the pan and the grass do not react in exactly the same way to the climate. Therefore a special coefficient is used (K pan) to relate one to the other. For the Class A evaporation pan, the K pan varies between 0.35 and 0.85. Average K pan = 0.70. For the Sunken Colorado pan, the K pan varies between 0.45 and 1.10. Average K pan = 0.80. Details of the pan coefficient are usually provided by the supplier of the pan. If the pan factor is not known the average value could be used (see box). If more accuracy is required, the pan factors given in Annex 1 should be applied. These values, however, only refer to the Class A evaporation pan and the Sunken Colorado pan. 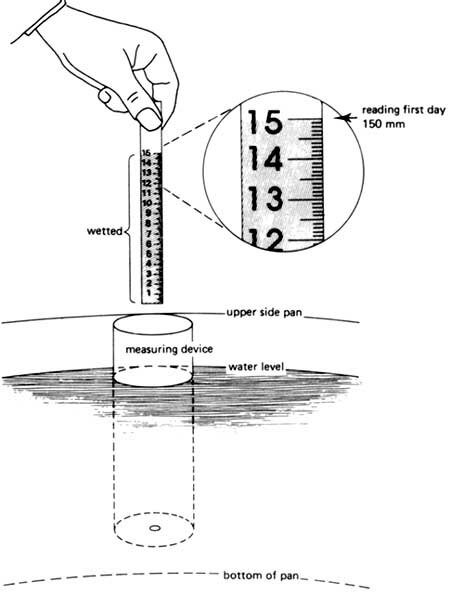 * Measuring devices are usually more accurate than the ruler indicated in Fig. 10 and thus allow for more accurate readings (see Data Sheet 1). If no measured data on pan evaporation are available locally, a theoretical method (e.g. the Blaney-Criddle method) to calculate the reference crop evapotranspiration ETo has to be used. There are a large number of theoretical methods to determine the ETo. Many of them have been determined and tested locally. If such local formulae are available they should be used. If such local formulae are not available one of the general theoretical methods has to be used. The most commonly used theoretical method is the modified Penman method which is described in detail in FAO Irrigation and Drainage Paper 24. This method, however, is rather complicated and beyond the scope of this manual. Here only the Blaney-Criddle method is given. The Blaney-Criddle method is simple, using measured data on temperature only (see also Fig. 11). It should be noted, however, that this method is not very accurate; it provides a rough estimate or "order of magnitude" only. Especially under "extreme" climatic conditions the Blaney-Criddle method is inaccurate: in windy, dry, sunny areas, the ETo is underestimated (up to some 60 percent), while in calm, humid, clouded areas, the ETo is overestimated (up to some 40 percent). The Blaney-Criddle method always refers to mean monthly values, both for the temperature and the ETo. If, for example, it is found that T mean in March is 28°C, it means that during the whole month of March the mean daily temperature is 28°C. To determine the value of p. Table 4 is used. 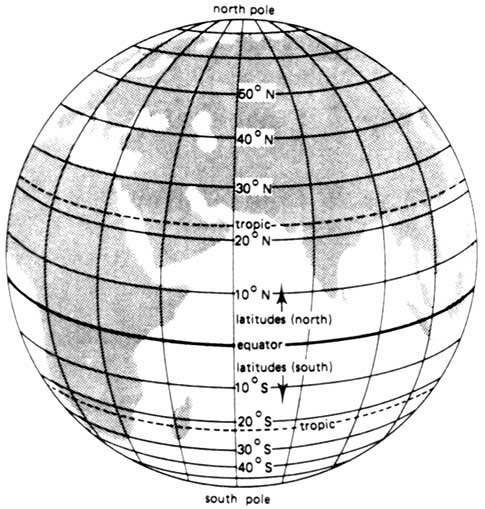 To be able to determine the p value it is essential to know the approximate latitude of the area: the number of degrees north or south of the equator (see Fig. 12). Suppose the p value for the month March has to be determined for an area with a latitude of 45° South. From Table 4 it can be seen that the p value during March = 0.28. Thus the mean reference crop evapotranspiration ETo =5.6 mm/day during the whole month of April. If only a rough estimate of the ETo value is required. Table 5 can be used. In section 3.1 the influence of the climate on crop water needs has been discussed. The influence of the climate is given by the reference crop evapotranspiration ETo; the reference crop used for this purpose is grass (see Fig. 13a). This section (3.2) deals with the influence of the crop type and growth stage on crop water needs. In other words, this section discusses the relationship between the reference grass crop and the crop actually grown in the field. Both ET crop and ETo are expressed in the same unit: usually in mm/day (as an average for a period of one month) or in mm/month. Fully developed maize, with its large leaf area will be able to transpire, and thus use, more water than the reference grass crop: Kc, maize is higher than 1. Cucumber, also fully developed, will use less water than the reference grass crop: Kc, cucumber is less than 1. A certain crop will use more water once it is fully developed, compared to a crop which has just recently been planted. The climate influences the duration of the total growing period and the various growth stages. In a cool climate a certain crop will grow slower than in a warm climate. Thus, to determine the crop factor Kc, it is necessary, for each crop, to know the total length of the growing season and the lengths of the various growth stages. The 3 steps mentioned above are dealt with in the sections 3.2.2, 3.2.3 and 3.2.4 respectively. Section 3.3 explains how the crop water need or crop evapotranspiration is determined. As the growing period heavily depends on local circumstances (e.g. local crop varieties) it is always best to obtain these data locally. Only if no data are available locally should Table 6 be used. As can be seen from Table 6 there is a large variation of values not only between crops but also within one crop type. In general it can be assumed that the growing period for a certain crop is longer when the climate is cool and shorter when the climate is warm. Once the total growing period is known, the duration (in days) of the various growth stages has to be determined. 1. The initial stage: this is the period from sowing or transplanting until the crop covers about 10% of the ground. 2. The crop development stage: this period starts at the end of the initial stage and lasts until the full ground cover has been reached (ground cover 70-80%); it does not necessarily mean that the crop is at its maximum height. 3. The mid - season stage: this period starts at the end of the crop development stage and lasts until maturity; it includes flowering and grain-setting. 4. The late season stage: this period starts at the end of the mid season stage and lasts until the last day of the harvest; it includes ripening. Table 7 shows the duration of the various growth stages for some of the major field crops. For each crop the "minimum" and "maximum" duration of total growing period (see also Table 6) have been taken and sub-divided in the various growth stages. For the "maximum" growing period of 150 days the following values apply: respectively 25, 35, 70 and 20 days. 2. When a crop is harvested "green" or "fresh" the late season stage is short. Compare, for example, green beans with dry beans (Table 7). The duration of the late season stage is 10 and 20 days respectively. 3. If a crop is planted in the winter or is growing in the cool season the total growing period is long. The same is the case with the individual lengths of growing stages. The difference will be most pronounced for the stage during which the temperature is the lowest. It should be kept in mind that the influence of variations in the total growing period on the crop water need is very important. Less important is the choice of the various lengths of growth stages. In other words: it is important to obtain (preferably locally) an accurate estimate of the total growing period. The duration of the four growth stages can be estimated with the help of Table 7. Note: The sum of the four growth stages should always equal the total growing period. Estimate the duration of the four growth stages for the following crops: cotton (190 days), lentils (160 days), sweet maize (100 days), potatoes (130 days), tomatoes/transplanted (140 days from transplant), etc. (the figures in brackets refer to the total growing period). Per crop, four crop factors have to be determined: one crop factor for each of the four growth stages. Table 8 indicates per crop the Kc values for each of the four growth stages. The table above shows average Kc values for the various crops and growth stages. In fact, the Kc is also dependent on the climate and, in particular, on the relative humidity and the windspeed. The values indicated above should be reduced by 0.05 if the relative humidity is high (RH > 80%) and the windspeed is low (u < 2 m/sec), e.g. Kc = 1.15 becomes Kc = 1.10. The values should be increased by 0.05 if the relative humidity is low (RH < 50%) and the windspeed is high (u > 5 m/sec), e.g. Kc = 1.05 becomes Kc = 1.10. In section 3.1 the determination of the reference crop evapotranspiration ETo has been discussed, while in section 3.2 it has been indicated how the crop factor Kc can be determined. This section (3.3) explains how the crop water need ET crop is calculated (see Fig. 15) on a monthly basis, using the formula: ET crop = ETo × Kc. Although the formula to calculate ET crop is easy to apply, there are still some practical problems to be overcome, which can best be explained using an example. Step 1: Estimate the duration of the various growth stages, using Table 7. Step 2: Indicate on table, as per example below, the ETo values and the duration of the growth stages. Note: When calculating the crop water needs, all months are assumed to have 30 days. For the calculation of the reference crop evapotranspiration (ETo, section 3.1), the actual number of days of each month is used e.g., January 31 days, February 28 or 29 days, etc. It can be seen from the table above that the months and growth stages do not correspond. As a consequence the ETo and the Kc values do not correspond. The Kc values are rounded to the nearest 0.05 or 0.00. Step 5: Calculate the monthly and seasonal crop water needs. Note: all months are assumed to have 30 days. In the previous sections it has been indicated how the crop water need is calculated for a variety of field crops: ET crop = Kc × ETo. However there are some crops that do not directly fit this model: their crop factor Kc is determined in a different way. The determination of their crop factor is explained in this section. Once the crop factor Kc has been determined, the same procedure (as described in the sections 3.3.1 and 3.3.2) is used to calculate the crop water needs. Alfalfa, pasture and clover are regularly cut during the year. Just after cutting they are in the "initial stage", while just before the next cutting, they are in the "late season stage". To determine the crop water need it is best to use an average value of the crop factor Kc. The average Kc values are given in Table 9. 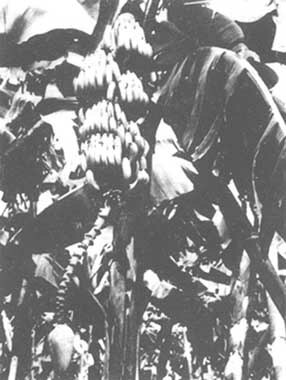 The establishment of a new banana plantation takes approximately 6 months from planting to full ground cover. 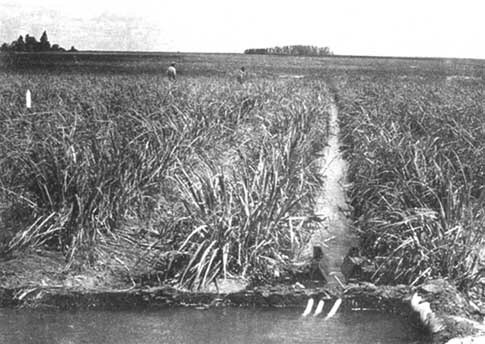 One year after planting, the first harvest takes place, after which the shoots that have produced are removed. Meanwhile young shoots have fully developed and take over the production. The Kc values for the first 6 months after planting are indicated in Table 10. After 6 months the Kc value remains constant: Kc = 1.1. The crop factor Kc for clean cultivated citrus is 0.70 year-round. This value is applicable for large mature trees, covering some 70% of the ground surface. If there is no weed control, a Kc value of 0.90 year-round should be used. For paddy rice the values indicated in Table 11 should be used. Crop coefficients for sugarcane vary widely depending on climate and sugarcane variety. It is best to use locally available data. If such data are not available. Tables 12a and 12b can be used. Table 12a refers to a virgin sugarcane crop from establishment to first harvest, which is assumed to take 18 months. Table 12b refers to a ratoon crop, which is the regrowth after the harvest of the virgin crop. The regrowth is assumed to take 12 months. Sometimes, depending on local practices, a virgin crop is followed by 2 or 3 ratoon crops. With the assumption that the grape harvest starts some 5 months after the first leaves appear, the Kc values indicated in Table 13 can be used for the months starting with the first leaf appearance. Table 14 gives indicative values of the crop water needs for the total growing period of various important field crops. The values indicated in the table provide a rough estimate and should only be used if the crop water needs cannot be calculated more accurately due to lack of data. Table 14 gives for each crop a minimum and a maximum value for the crop water need. As the crop water needs depend heavily on the duration of the total growing period, the maximum value should be used in the case of a long total growing period (see also Table 6) and the minimum value should be used when the total growing period is short. An average value is to be used with a medium total growing period. In addition, Table 14 gives an indication of the sensitivity of the various crops to water shortages or drought. If the sensitivity is high it means that the crop cannot withstand water shortages very well and such shortages should be avoided. If the sensitivity is low it means that the crop is relatively drought resistant and can withstand water shortages fairly well.